On Monday I addressed a question I've been getting pretty often over the last couple months and posted a step-by-step tutorial for creating crisp lines and pinstripes with paint. Today, continuing in the Dear Abby vein, I'm going to talk about two paint colors that I get asked about! An aside: Maybe we should start an "Ask Anna" feature here on Take the Side Street. You could ask me anything, bonus points for crazy questions! I'm a sharer, and I have an opinion about pretty much everything. Just sayi﻿ng, we should consider it. Feel free to overwhelm me with earth-shatteringly important questions about your love life, carpet color, pet guinea pigs or baked goods. If I don't know the answer, rest assured I won't rest until I track it down! Unless your question is about politics or religion, and then I'll probably pretend I lost the email. Guffaw. How do people actually guffaw? Is it unladylike? Maybe I should ask myself, hardy har har. Anyway, moving on to paint colors. I've been asked for quite some time about the paint color in my master bedroom, and I've answered it in emails and I think comments, but I wanted to put it out there for the universe. 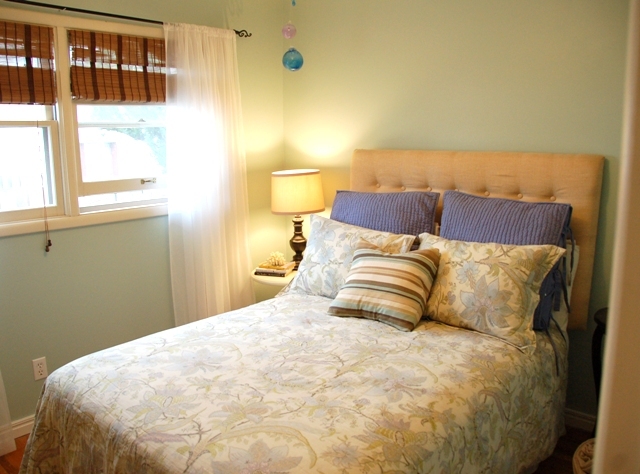 The color in my master bedroom is 'Comfort Gray' by Sherwin Williams. Except it's actually not identical, because I get my paint made at Lowes or Home Depot and their computers aren't so hot at matching Sherwin Williams and Benjamin Moore colors, in my experience and opinion. So, to be specific, it's a color match of "Comfort Gray" in Valspar paint. I've also gotten a lot of questions about the new paint color in my guest room. This one is a bit more complicated. I wanted 'Rainwashed' by Sherwin Williams, but I had learned my lesson about colormatching so I had the friendly employees at Lowe's do it manually after a seriously unsatisfactory attempt by their computers. It took two different bases and a couple hours (and a husband telling me I was nutty for being this much of a perfectionist), but I really wanted that blue-green shade that I loved. I was so worried that it wouldn't be close, I actually bought a $5 sample of 'Rainwashed' at Sherwin Williams and painted it next to my custom color, and they were almost identical but mine had maybe half a smidge more green and I actually liked it better. Mwahaha. Success. 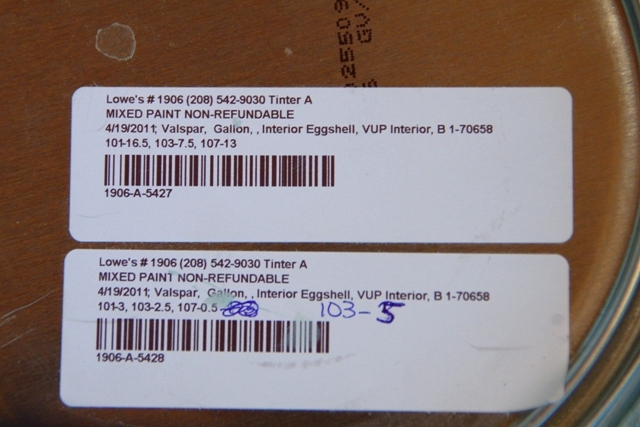 The paint is Valspar Eggshell Base 1 (#70658), by the way... just in case it doesn't say that in fancy paint-speak on the label. 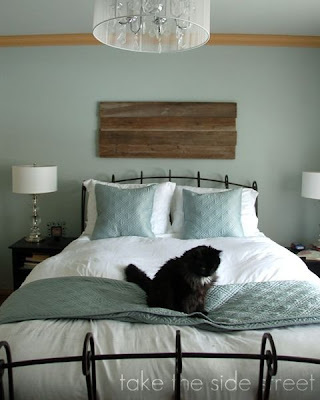 Someday, I'll post the results of my two grey rooms on my blog. Until then, I'm enjoying looking at yours. And, because I'm behind on all my blog-trolling, holy cute makeover batman! Love the new header. I learned the hard way about the color match! I was trying to match a fine detail line in our patterned floor tiles. I found the perfect shade but went to Home Depot for the paint... I ended up going back and buying a quart of the untinted white and custom mixing my color for the perfect match. Thanks for sharing this article, it has really been a very helpful read. I've personally never had the chance to deal much with air conditioning installation in Rowlett TX. I'm really excited to get it fixed. It's funny how we don't appreciate things until they are gone.